"American oil production is the highest that it’s been in eight years, and we are less reliant on foreign oil than at any time in the last 16 years." That's what it says on the barackobama.com website and strictly speaking it's true. Petroleum imports are down relative to domestic production. The question is, does this have anything to do with President Obama's policies? While domestic petroleum production is up marginally, it's not nearly enough to explain a significant drop in the percentage of net oil imports. Anyway, most of the increase in domestic production occurred before Obama administration policies could have had any impact. Also, people have been buying more fuel efficient vehicles (Humvees are so last century) which has resulted in decreased demand for oil, but that trend was going on long before the dip in imports began, not to mention before Obama's election. Panderbear notes that the statistically significant decline in foreign oil imports coincides with the beginning of the Great Recession. It seems likely that imports are down because demand is down and that demand is down primarily because people are driving less to save money. It also seems likely that the percentage of net oil imports will rebound along with the the U.S. economy. 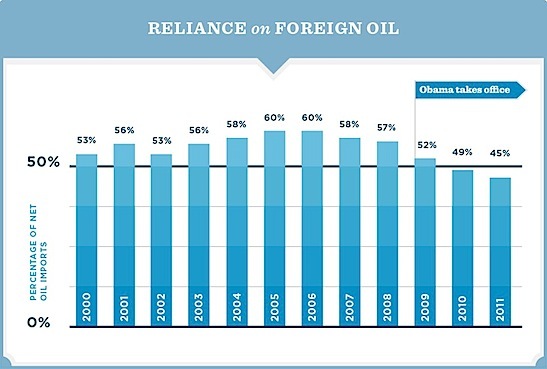 To be fair, the text accompanying the graphic on barackobama.com did not explicitly claim Obama administration policies brought about the decrease in reliance on oil imports, but the implication is clear. In Panderbear's opinion this constitutes a pander, albeit a subtle one. The chart does, however, expose as a first-degree pander the Republican claim that the president's policies have stifled domestic petroleum production.